Mike Moore | The Journal Gazette TinCaps right fielder Jack Suwinski connects for a two-run triple in the second inning Monday against Bowling Green. 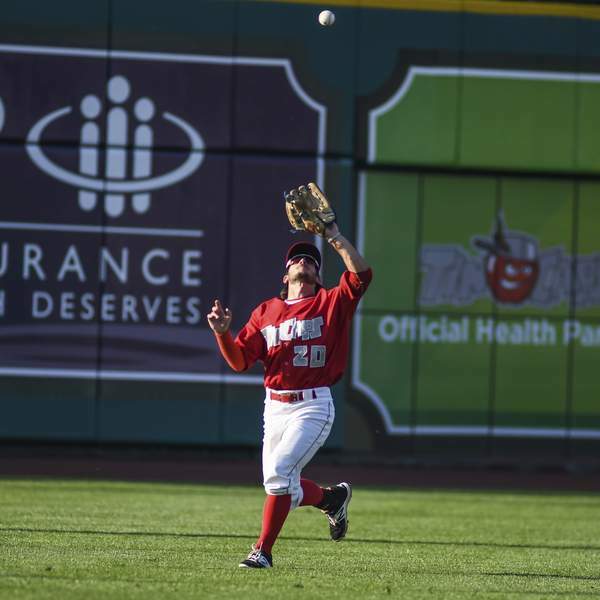 Mike Moore | The Journal Gazette TinCaps left fielder Robbie Podorsky catches a pop fly in the second inning against Bowling Green at Parkview Field on Monday. 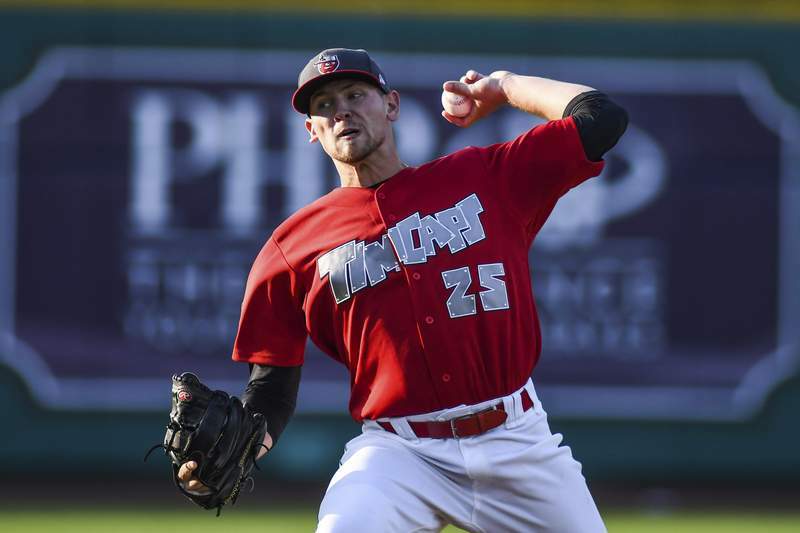 Mike Moore | The Journal Gazette TinCaps starter Nick Margevicius pitched seven innings Monday. He gave up one run on five hits. The TinCaps have gone above .500 for the first time this season. After losing their first two games of the second half, Fort Wayne has won three in a row, including a resounding 5-1 victory tonight over red-hot Bowling Green, which came in having won 14 of 15 games dating back to the first half. Nick Margevicius was typically excellent tonight, going seven innings and striking out five while giving up just five hits. He also did not walk a batter for the third straight start, extending his league lead in K/BB ratio. Since walking five hitters in one start on April 29, the left-hander has given out just three free passes in 43 innings over eight starts. In other words, his command has been nearly perfect, as it was tonight, when he located his fastball essentially anywhere he wanted it in any count. His curveball was also devastating. "My curveball was really sharp tonight," Margevicius said. "I felt like I got some life back in my fastball after the (All-Star) break. My body feels really refreshed after taking some time off and getting ready for the second half, so I feel like a combination of those things really led to the outing tonight." Margevicius said that he thought about putting the TinCaps above .500 for the first time after failing to do so on Opening Night back in April (although that was through no fault of his own as he took a no-hitter into the sixth that night). He accomplished that mission and got the win to improve to 5-4. 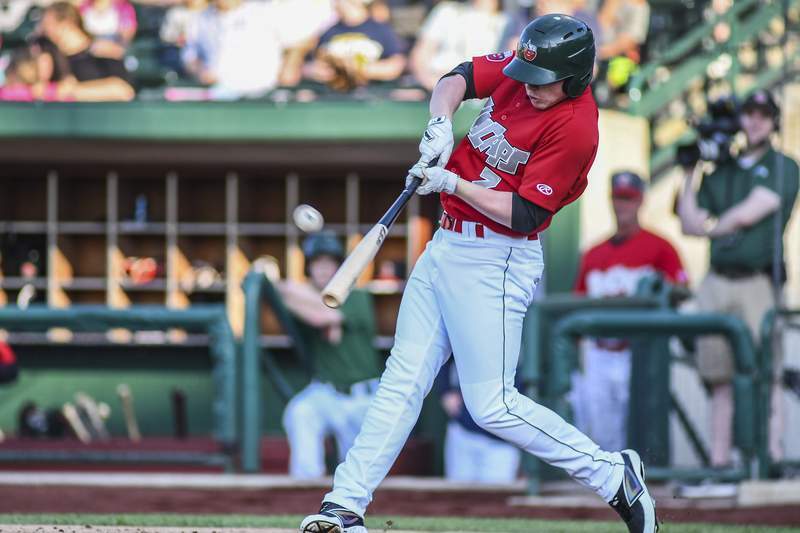 The TinCaps got a huge two-run triple from Jack Suwinski tonight, but most of their offense came courtesy of walks, hit batters and errors by the Hot Rods, of which there were four. Two of those helped push across two runs in the sixth that effectively put the game away. Speedster Robbie Podorsky reached twice on errors and has done so four times in the last two games. That might seem like a coincidence, but with Podorsky's speed, I really doubt it is. He's so fast that fielders have to rush every time he puts the ball in play on the ground and that has led to a lot of mistakes. That probably won't happen as he climbs the minor-league ladder, but in the Midwest League, his speed affects nearly every play. "Again Robbie Podorsky's involved in two of those (errors)," manager Anthony Contreras said. "He puts pressure on those defenses, but when teams give us opportunities like that, it's crucial that we make them pay. It's the same thing when we make errors, most of the time it's causing an extended inning or it's resulting in a run, so when we get those opportunities we need to take full advantage." The TinCaps didn't treat this game like it was a statement matchup – Contreras confessed to being unaware of how hot Bowling Green had been – but it kind of felt that way. Fort Wayne plans to be a player in the Eastern Division race in the second half and taking this series from the Hot Rods early on would be a good way to announce their presence.